I'm heading north soon to fish with some friends, and in part I'll be chasing toothy critters like muskie and pike. This has been an annual trip, but due to my move to Georgia I missed it last year, and it feels like forever since I've gone. I fish with my friends Tom and Dave and an assortment of other characters who have wandered in and out of camp over the years. It's kind of a last hurrah of the fly fishing season in the north. From dawn until dusk we cast giant flies to dark water with 400 grain sink tip lines until our hands curl into useless claws and our tendons twang like guitar strings. Then we retire to camp to sit around the fire at night, nurse our wounds, drink libations (it's hot tea for me these days), tell lies, and howl with the wolves. I tie as many of my own flies as I practically can. 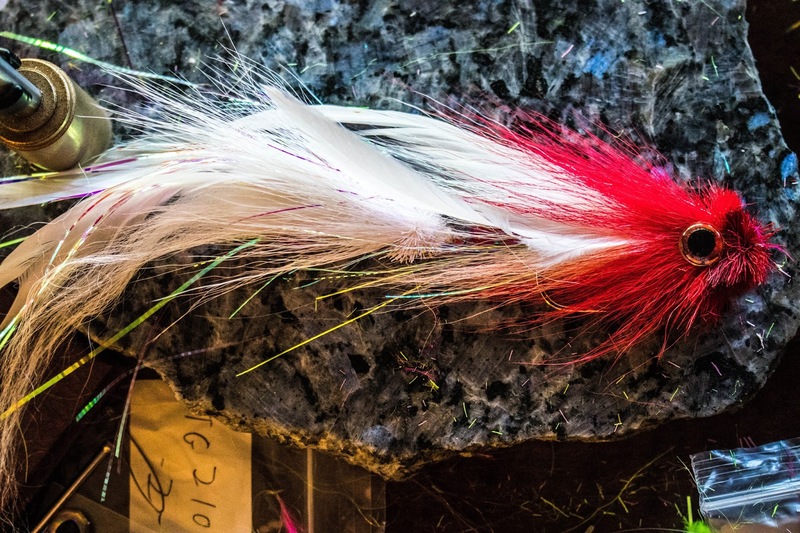 There are a lot of great flies you can tie that will catch you a lot of fish, and can be tied without having to be a master at the vise. I am not a master by any means. I have some basic skills and a large pile of materials. I do what I can. I'll probably never master dry flies. The learning curve is too steep, and small details matter. 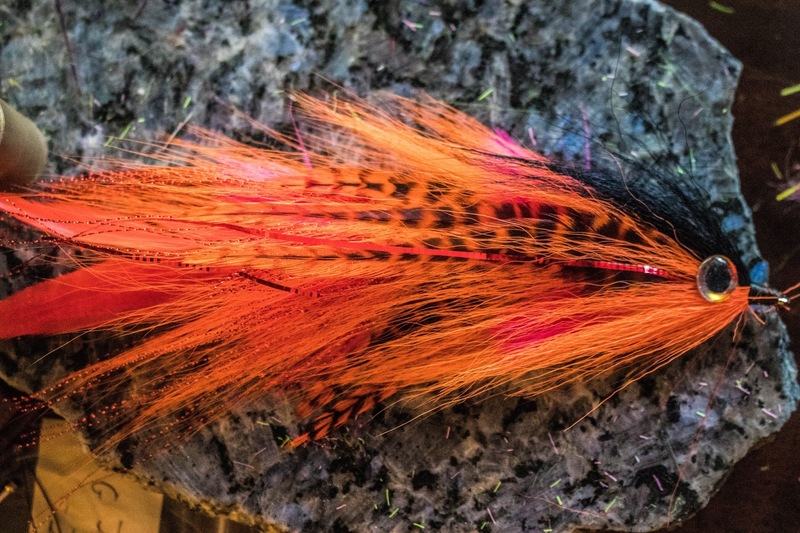 I can buy dry flies for less than the materials I would need, and it would take me at least 100 flies per pattern to get the techniques, proportions and finish down to where fish would actually eat them. Streamers are an entirely different proposition. 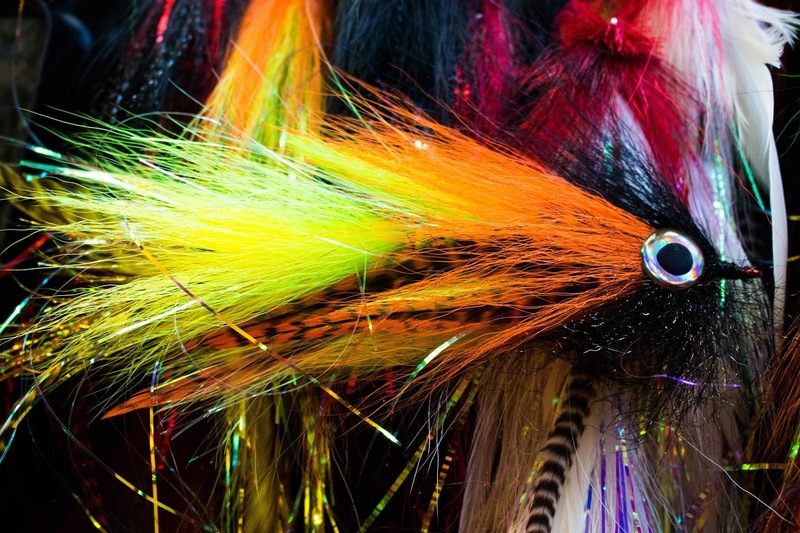 The price per fly is much higher, and for me the concepts are easier to grasp and execute. At twenty to thirty dollars a pop those big musky flies don't come cheap. 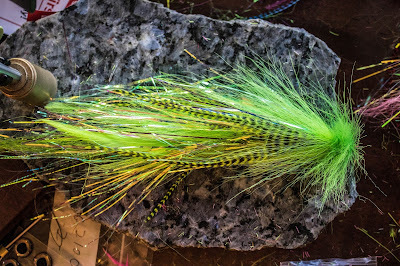 It's worth my time at the vise to hammer out a few patterns, and if they're not perfect (they're not) the pike and musky don't seem to care. I learned to tie a lot of this stuff from Mike Schultz (Schultz Outfitters). 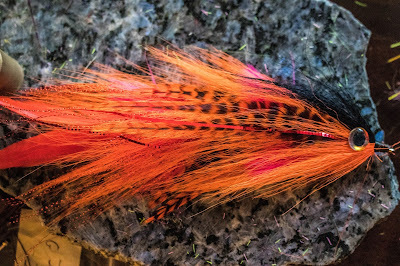 I think there were three of us at the class, and we tied Bufords and a Schultzy original he calls the Kickin' Chickin'. 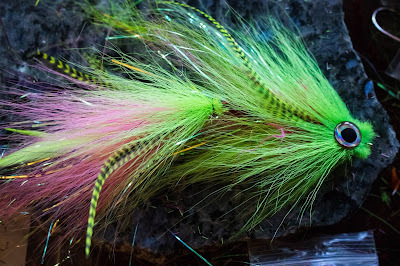 Despite Mike's best efforts my flies turned out to be a mish-mash of bad color combos and clumps of flash sticking out at odd angles, but they looked great in the water and worked on hammer handle pike all day long. With this trip coming up I've done what we all do and perused my pile of fishing gear to see what I had and what I needed. 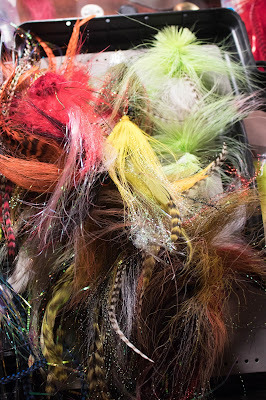 When I opened the musky box it looked like unholy hell, just a jumbled pile of hair, hooks, beads, and wire. Some of the flies are one-eyed and mean looking. Some gave me pleading looks, begging me to end their misery and put them down. So I took every fly out of the box, except the two that have actually caught musky, and started over. Like Dr. Frankenstein, I'll be salvaging parts from those old flies. I ordered a bunch of materials from lurepartsonline.com and got to work. One thing I've struggled with is reverse tying my bucktail. You tie your bucktail in pointing towards the front of the hook, then force it backward and tie a thread dam in front of the bases so that the hair sticks out at nearly a ninety degree angle from the hook shank. This imparts a crazy amount of movement to the fly but if you don't get it just right, a hammer handle pike can pop a thread or shift the hair and before you know it your fly box looks like a 80's night club. All the cool kids are doing it, but I can't seem to get the hang of it. 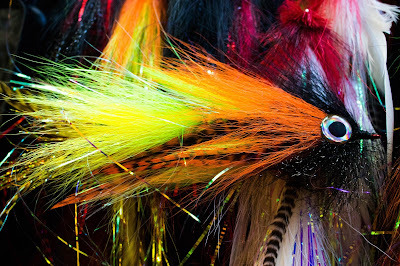 Then I had a very enlightening conversation last year at a fly show, with Eli Berant of Great Lakes Fly. When I asked him he told me he doesn't reverse tie at all. His flies have accounted for a lot of big musky I can assure you. 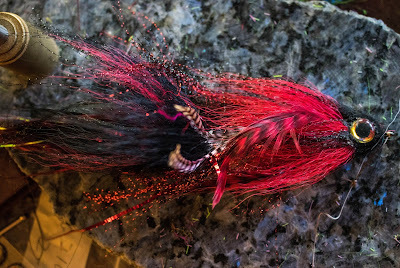 Be sure and click on the link and check out his flies and fish pics. So I quit reverse tying, and I'm very happy with the results so far. We'll see what the fish think. I've done a better job of hiding my transitions and hook articulations, and my color combos are looking much better. I haven't swam any of them, but I'm hopeful. Michigan has a lot of great musky water, but little of the musky culture that Wisconsin and Minnesota have. I haven't done much with this blog since I moved, but I'll try to take you along on this trip. I'll leave you with a brief gallery of my flies. I love the first one. I'm a sucker for a pink and chartreuse fly. I know a lot of guys swear by both colors. "Amazing" is a bit of a stretch, but I know they'll catch fish. Those look dang good. Time to start doing elbow, wrist, and shoulder stretches.